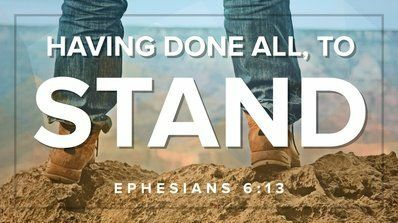 Ephesians 6:13Therefore put on the full armor of God, so that when the day of evil comes, you may be able to stand your ground, and after you have done everything, to stand. There is armor and then there is the FULL armor. The full armor covers everything. God's got us covered. When we have this on we are protected in such a way that we can stand in the midst of any battle and make it. I have been in the middle of many situations in my life that have felt like battles. I have fought and fought and just when it seems like I get out in front of the battle there is a new twist. I'm at the place now that our scripture talks about...having done all you can do...STAND. I have said, alright, enough is enough! It's that place where you are sick and tired of being sick and tired. That season where every nerve has been pushed to its limit. It's the point of no return. And praise the Lord that is where God takes over! He is "more than enough"...El Shaddai and He is able to do exceedingly and abundantly above all that I ask, think or imagine! When I am at the end, He is only beginning! Where I stop, He begins! Maybe you are right there with me today. Release the Lord to do what must be done to bring you to a place of victory by letting go of it yourself! Having done all you can do...it's time to just stand!